I was given a fluffy wolf hat for Christmas, and yes, I will be wearing it in public. No shame. 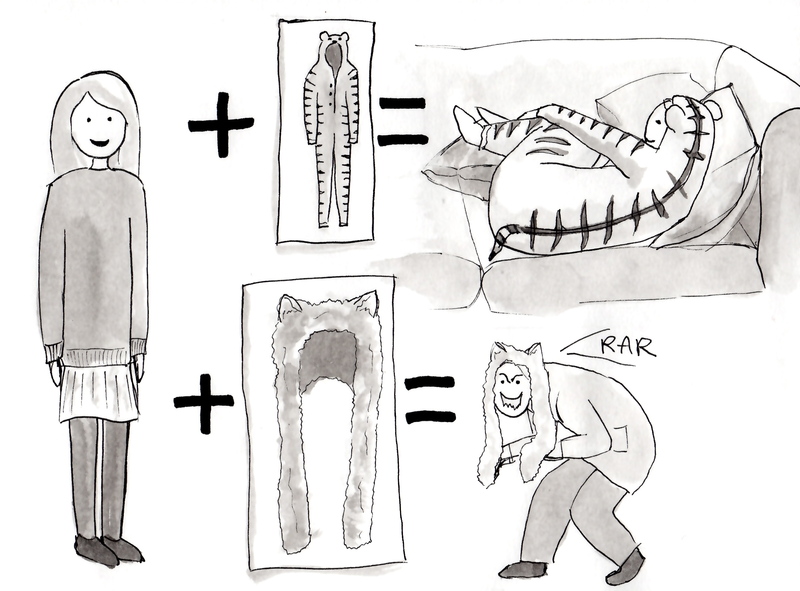 Last year’s animal-themed present was my tiger onesie, which has made prior appearances on this blog. It’s still going strong, although its convenience is marred by having to rapidly change into something less eccentric on the rare occasions I need to answer the door (suprisingly often to Jehovah’s witnesses, despite the fact we live in the dead centre of nowhere). The problem is, it’s very difficult to wear any form of animal costume without finding yourself behaving a lot like the animal in question. At least, I find this to be the case. You might not. You might not even have any animal-themed headwear, in which case I berate you for your lack of imagination. I maintain that my onesie is largely responsible for my sleep habits at the moment, which include cat naps whenever possible and 9-14 hours a night when I can get away with it. Hibernation is an idea we humans need to take on board as soon as possible.